Win the Ultimate Kids Prize Package! Enter now for a chance to win a subscription for 6 monthly mission kits from Junior Explorers and 1 Kurio Xtreme Android Tablet! Who would not love this package! A cool prize pack for the kid in your life. Are you ready for a BIG adventure? In honor of Earth Day, Junior Explorers and Kurio are teaming up to offer the ultimate kids prize package! Kurio is the kids tablet for families, with parental controls safe web surfing and a lots of preloaded apps. 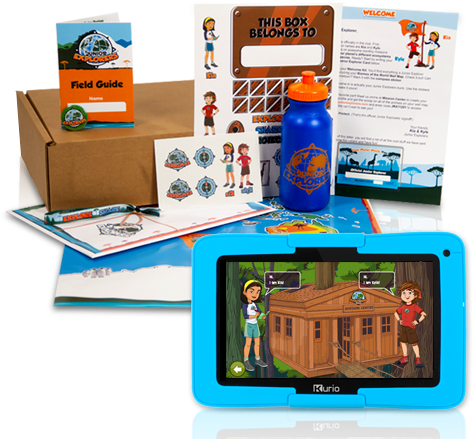 Enter to win a subscription for 6 monthly mission kits from Junior Explorers and 1 Kurio Xtreme Android Tablet. One lucky winner will inspire their kids to love wildlife and nature with this amazing grand prize! Happy Earth Day! — Includes fun, educational online games All you have to do is ENTER HERE TO WIN! Good Luck All!